REALITY is enough consists of more than fifty essays chapters – bundled into three themed sections: 1. Thinking about Thinking, 2. Wondering about Religion and 3. Defending Science. The author dissects the mind, exploring what it is to be an atheist in a religious world, and shows how science – particularly biology – is under attack from extreme religion. He explores aspects of brain behaviour that have interested him as he sorted out his own life and explored the extraordinarily baffling phenomenon of religion, paying special attention to its interaction with science. With reference to science as it really is and a dash of good humour, he demonstrates how religiously driven pseudo-scientists are, more often than not, just plain wrong when they prattle on about science they don’t or won’t understand. His arguments are based on the inadequacy of beliefs to explain anything, whilst he wisely avoids the valid but hazardous topic – wherein lies irreconcilable dispute – of which out of religion and science is true or false. Instead, he shows how the anti-science case relies on nonsensical reality-contradicting beliefs and incorrect, skewed, bogus, made-up versions of scientific ideas and facts – not what scientists ever actually thought, said or published. 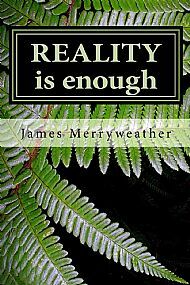 James Merryweather explores belief versus reality and what different people mean when they refer to ‘truth’. He maintains that when belief agrees with reality it makes no difference and when it doesn’t, it still makes no difference – to reality. "I'm enjoying reading your book. Makes me laugh and agree at the same time! My devoutly catholic parents would be horrified to know I read it." Anon. "Reality is enough, is an engaging and well-researched one. His writing is authoritative and amusing, and he has thought deeply. He mercilessly exposes the inner workings of his own mind, and tells us candidly of the experiences that have moulded it, and of his journey towards repairing the damage that life has done it. His description of how he sees numbers and dates (a sort of magical mystery tour) gave me an astonishing insight into how someone else sees the world. "The power of his delight in and extensive knowledge of the workings of nature, and equally the strength of his feelings concerning mankind's many follies, both come over clearly here. The conclusions he draws in his essays on various subjects are inarguable but, unfortunately, even if he manages to get beyond preaching to the converted, I'm fairly certain that he will not change the closed minds of those he so wishes to enlighten." Chris Gutteridge. "When I moved to the Highlands I was shocked to discover that creationist views were alive and kicking and considered mainstream by many people. In local paper columns and letters pages you could see these idea's being expressed as though they were fact. I also find it baffling how many otherwise intelligent people still believe in astrology, alternative medicine, ghosts and fairies etc. "Reality is Enough lives up to it's title. It is an entertaining, logical and (reasonably) comprehensive demolition of the anti-science brigades; written in a personal style with plentiful anecdotes about the behaviours, beliefs and propaganda of characters who live in this modern land of ours." Mark Hennessey. "Somewhat rambling at times, but gives food for thought (for those who are prepared to think). It is however interesting to consider that there are quite eminent scientists who take a contrary view." Dr Christopher Walker.